Hunter College was primarily a commuter college; there weren’t any dorms on the campus grounds. 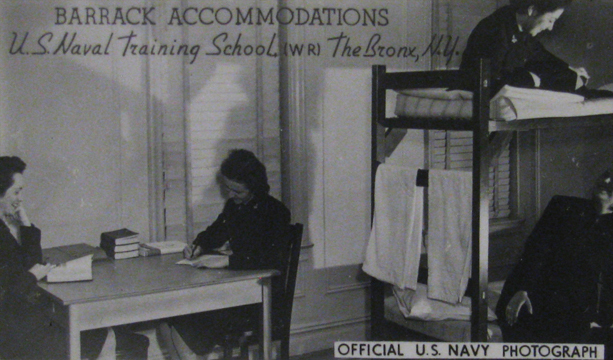 The Navy needed housing for 8,000-10,000 women at a time (plus instructors), so it turned to the Bronx neighborhood for help. Apartments surrounding the campus were commandeered by the Navy for the duration of the war. This photograph comes from a postcard booklet designed for WAVES recruits to send it home to their parents, families and friends. It shows the converted apartments, where women lived 8-10 to a one bedroom unit. It is from the Betty H. Carter Women Veterans Historical Project at the University of North Carolina Greensboro.